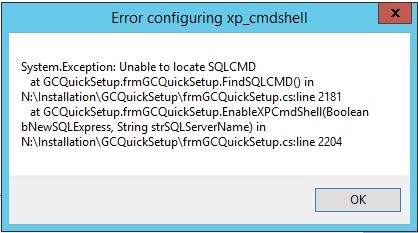 When installing GeoCue software using the quick installer an error may be encountered while attempting to configure the SQL server and the GeoCue Database. The GeoCue quick installer requires that the SQL server and the GeoCue Database exist on the same machine. If this is not the case then this error will occur. Open the GeoCue Server Database Manager. If updating an existing GeoCue Server, verify that the database is connected. Then, press the ‘Update’ button under the ‘Database’ tab to complete the installation. If installing a new server, select the SQL instance that you would like to use. Then Install the database. Then, if enabled, press the ‘Update’ button under the ‘Database’ tab to complete the installation. This entry was posted in GeoCue, GeoCue Installation, Licensing and Updates and tagged cmdshell, Database, SQL, SQLCMD, xp cmdshell, xp_cmdshell.